← Let Go of Worry the Easy Way! Are you holding onto a grudge against someone? Did someone wrong you in a big way…or even a small way you can’t let go of? Do you get angry every time you think of that person? Or worse yet, every time you run into them? Are they a family member, an ex-spouse, a boss who did you wrong or someone you grew up with that might have molested you? There are so many people we have in our lives and so many things we could hold onto forever instead of forgiving. While some things seem impossible to forgive, others are small and don’t really matter to us. Those things we hold onto weigh us down and can stop us from moving forward. In the case of theft, molestation, someone cheating on you, or something else equally as awful, we can get stuck in our unforgiveness, anger or fear for a really long time. Holding onto the anger and dragging it with us everywhere. It impacts our life in so many ways. It could stop us from having a close loving relationship; a high paying job; trusting can be a huge issue; and we even might feel like someone is trying to take advantage of us, whether they truly are or not. These things can set us off either in flight or in full attack mode, and we can lose everything important to us if we let it get the better of us. 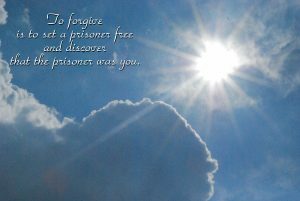 By not forgiving we lose, but does the person we are holding that grudge against lose too? Ummmmmmmmm, not really. They go on their merry way maybe not caring or even knowing you have a weight, or a pain, or a feeling of betrayal they’ve left behind that you may be lugging around. You might even feel that they ruined your life, but they would have no clue about that. That is definitely not fair! But what if forgiving was a choice? If you could choose to let go…would you? Would it be a relief or do you want to hold onto that anger? So many times we say, there is no WAY I could forgive anything as awful as that! They deserve to be boiled in oil….or something. Our anger is our self-protection. It keeps the world at bay so we don’t have to deal with something similar happening. But if you can truly let go, you are freeing yourself to have that life that you’ve always wanted. And wouldn’t you love to be close to people and allow yourself to love and trust; finding your joy in life? So how do you do it? First, forgive yourself if you need to. You are not at fault and there is nothing to forgive. Love yourself enough to start there. And then, forgive the other person. If they truly are awful, start with being glad that you aren’t them. If you need to, forgive them in spite of who or what they are. Don’t let them have the last laugh. And if you still can’t do it and you believe in a higher power, turn them over to divine source. You really can choose. Let go of those that hold you back and choose to embrace the new, joyful, fun, amazing new you.